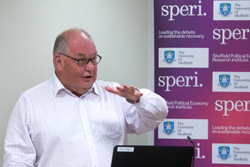 The SPERI Conference at Halifax Hall in Sheffield got into its stride on its second day. The morning began with an intensive and wide-ranging discussion of the ‘Transformation of Welfare Provision’ in conditions of austerity across Europe. 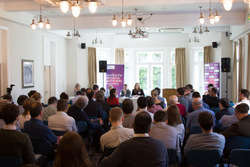 Chaired by SPERI Research Fellow Genevieve Lebaron, Professor Brian Burgoon (University of Amsterdam), Professor Mary Evans (London School of Economics), Dr Zoe Irving (University of York) and Professor Andrew Gamble (SPERI) set out their varying views and responded to many questions from a full audience. Fifteen panels on a diverse set of political economy themes then took place during the rest of the morning in the afternoon before Roger Liddle, Co-Chair of Policy Network and a member of the House of Lords, delivered an engaging pre-dinner talk. His title aptly summarised his contribution: ‘Reflections on working with and within the European Union: After the Referendum’. The Conference dinner then ended the formalities of the day, although political economy continued to be much discussed in the Halifax Hall bar after dinner.